A provocative and witty look at how our private spaces–from boardroom to bedroom–reveal our personalities, whether we know it or not! Does what’s on your desk reveal what’s on your mind? Do those pictures on your walls tell true tales about you? And is your favorite outfit about to give you away? For the last ten years psychologist Sam Gosling has been studying how people project (and protect) their inner selves. By exploring our private worlds (desks, bedrooms, even our clothes and our cars), he shows not only how we showcase our personalities in unexpected–and unplanned–ways, but also how we create personality in the first place, communicate it to others, and interpret the world around us. One bright September morning in 1960, John Steinbeck and his French poodle, Charley, embarked on a grand tour of the United States. The writer and his beloved pooch spent the next three months traveling around the country in a truck specially modified for their expedition. Together they went in search of the real America. Travels with Charley chronicles their journey. Steinbeck’s observation draws on an intuition that the environments people craft around themselves are rich with information about their personalities, values, and lifestyles. From some laundry receipts, an unfinished letter in the wastebasket, an empty bourbon bottle, and other assorted clues, Steinbeck pieced together a portrait of Lonesome Harry. Each of us faces similar challenges every day. You piece together bits of evidence, wherever you can find them, to form coherent portraits of the characters who populate your social spheres. 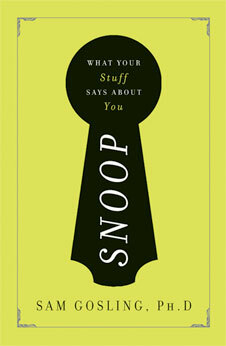 You draw on information from your long history with dear old friends, you make snap judgments from thin slices of behavior in brief social interactions— the so-called zero-acquaintance contexts—and, if you’re a snooper, you use clues left by people you’ve never met. You integrate new information, toss out current beliefs, and fill the gaps with new working hypotheses. But what are the mechanisms by which personality reaches out and connects to the physical world? How exactly does the self send its signals? These were the questions driving my research when, in 1997, I assembled my first team of environmental assessors to help me develop a science of snooping. One of our goals was to explore the ways in which people have an impact on their personal spaces. What evidence of their characters do they leave behind? What elements of personality are most likely to leave traces? I also wanted to examine the judgments my assessors made on the basis of these spaces. I was not trying to improve the judging process, but to examine ordinary, everyday evaluations—the kind you and I might make, not the sort that would interest the FBI. After much discussion with my graduate advisor, I formulated a plan. I would recruit a bunch of volunteers who, at a specified time, would vacate their rooms. While they were gone, I would send in a team of judges to form an impression of the recently departed purely from evidence in their rooms. Next, I would send in another team of coders to assess the physical features of the space. We would also give the rooms’ occupants personality tests and collect information about them from their friends. As an impoverished graduate student, all I could offer the volunteers as an incentive was feedback on how others viewed them on the basis of their rooms. To my surprise, almost a hundred people signed up; then, as word of the study got out, others came around, virtually begging to be included. As soon as I set foot in the first room, I knew we were on to something. The rooms varied much more than I had expected, not only in the quantity of objects but also in the nature of the objects themselves. Some rooms contained little more than a modest bed in the corner. Others were so full of objects and so adorned with decorations that our assessors had to be careful not to crush the evidence they were there to examine. And even in the overflowing rooms there was much variation in the objects that fought for territory on the shelves, chairs, beds, floors, and windowsills. One such room exhibited a magnificent collection of Star Wars figurines and toys, a theme echoed in the posters adorning the walls and ceiling. Winnie the Pooh and friends were featured in a surprising number of rooms. Some spaces were meticulously arranged; others suggested that the occupant was aiming for a level of organization best described as “somewhere in the room.” Some spaces were dark and stale, others light and breezy. Some were cozy, others cold. As we examined the rooms, we began to notice their occupants’ psychological footprints and to glimpse the different ways personality is expressed. Three broad mechanisms—identity claims, feeling regulators, and behavioral residue—seemed to connect people to the spaces that surrounded them. These mechanisms stood out especially clearly in the rooms of occupants I’ll call Cindy, Duncan, and Gideon.